Dr. Kavic has many decades of experience as a General Surgeon. He began practicing medicine in 1982 as an Associate in practice with Michael Kavic, his father. From there, Dr. Kavic held positions at several hospitals across Western Pennsylvania and Minnesota, including his most recent position as the owner of a private practice in Clearfield, PA for 21 years. The overall average patient rating of Dr. Timothy N Kavic is Good. Dr. Timothy N Kavic has been rated by 2 patients. From those 2 patients 1 of those left a comment along with their rating. The overall rating for Dr. Timothy N Kavic is 3.0 of 5.0 stars. I would never go back. He is arrogant and his degree of expertise in his current position of treating veins and vascular issues is sub-par. I'm sure he was fine as a general surgeon but it seems as through his heart is not in this and his only reason for doing this is so he can work weekday/daylight hours. Also, do not expect to have much of a rapport with this doctor as he forgets everything about you the minute you leave. Dr. Kavic is affiliated (can practice and admit patients) with the following hospital(s). 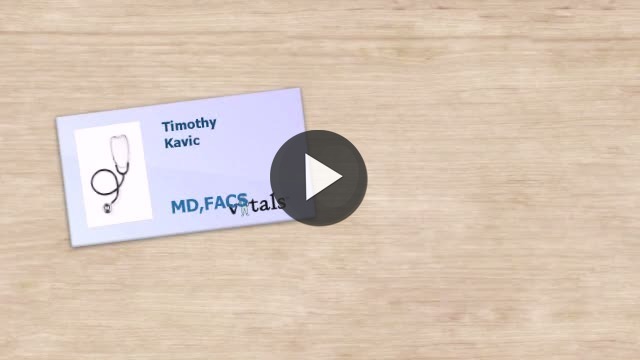 Take a minute to learn about Dr. Timothy N Kavic, MD - Surgery in Aliquippa, PA, in this video. Dr. Timothy N Kavic is similar to the following 4 Doctors near Aliquippa, PA.
Have you had a recent visit with Dr. Timothy N Kavic? Select a star to let us know how it was.